African American teacher, preacher, & Revolutionary War veteran. Taught free black & prominent white students in school nearby. The marker, originally approved and erected in 1938 (the centennial of Chavis's death), was the first one in the North Carolina Highway Historical Marker Program dedicated to African American history. 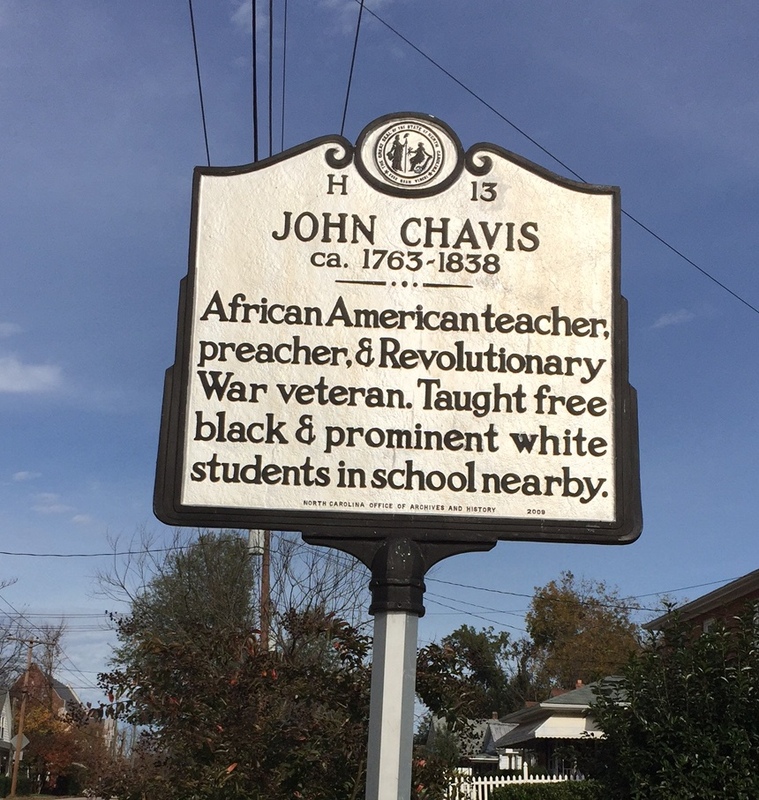 John Chavis, born around 1763 in Virginia, was a prominent free black preacher and educator in and around the Raleigh area from 1810 onwards. Chavis was raised in Virginia and had an extensive education for the time period, likely the best education of any African American of his day in North Carolina. He is best known for his classical teaching in Raleigh, educating children of all races and from all different backgrounds. In 1832 free blacks lost many of their rights in North Carolina, and Chavis lost his freedom to preach and to teach. He died in 1838, having lived and worked as a respected member of society amongst all races of people. Chavis is considered by many historians to be the first free black to demonstrate to white slaveowners the abilities of blacks in formal education. Between 1801 and 1807, John Chavis did mission work among slaves for the Presbyterian Church throughout the southeastern United States. In 1809 Chavis moved to Raleigh, where he began preaching as a part of the Orange County Presbytery in the surrounding areas. 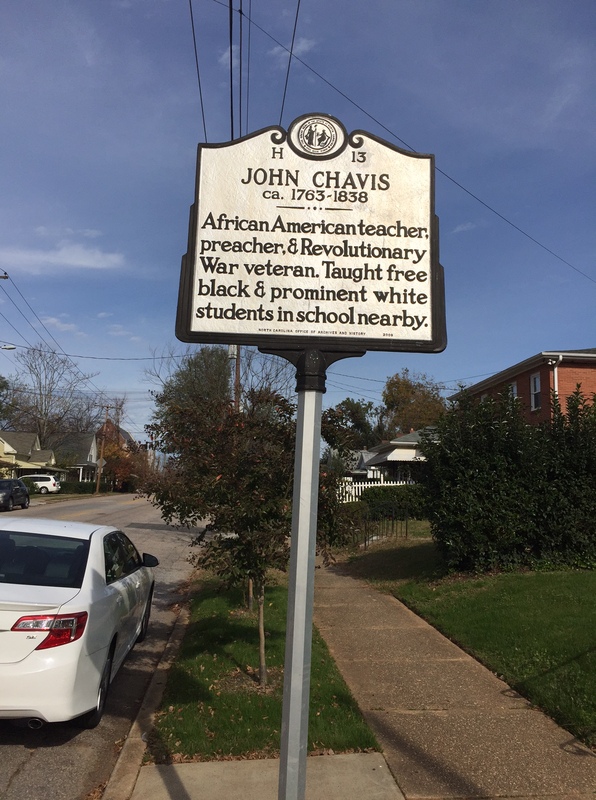 It was around this time that Chavis began his school, called the John Chavis School, near where the John Chavis Memorial Park is now located. Chavis’ school accepted both black and white students, widely expanding the options available for the education of free blacks in Raleigh at the time. Chavis taught the blacks and whites separately, with the white students attending classes during the day and the black students during the evening. Many of Chavis’s students were from notable families in North Carolina, including future Governor Charles Manly and the sons of Chief Justice Leonard Henderson. Although it is uncertain, it is believed that John Chavis also instructed future United States Senator Willie P. Mangum. Following Nat Turner’s Rebellion, free blacks across the south lost their standing as citizens. Chavis could no longer legally preach or educate, and was forced to close his school and retire. In 1833 he published his only written work, a sermon entitled An Essay on Atonement. The work was successful and widely read, and helped to supplement his income during the final years of his life. Chavis died on June 15, 1838. His burial location is unknown, although there is a theory that the grave is on the land of Willie P. Mangum’s former plantation in present-day Durham County.